If canceled or modified up to 24 hours before the date of arrival, no fee will be charged. If canceled with 24 hours of arrival or no show 100 percent of the first night will be charged. Call hotel for more details. This refreshed smoking room with 1 king bed features Free WiFi, Free breakfast, Free parking, a flat-screen TV with cable channels for your entertainment. For your comfort, this room is equipped with a microwave, and refrigerator, an alarm clock, radio, telephone, personal climate control, private bathroom, and complimentary toiletries. Accepted Payment Methods: Visa, MasterCard, American Express, Diners Club, Carte Blanche, Discover, JCB. This hotel reserves the right to pre-authorize credit cards prior to arrival. Guests are required to show a Government issued photo identification and a credit card upon check-in. Please note that all Special Requests are subject to availability and additional charges may apply. 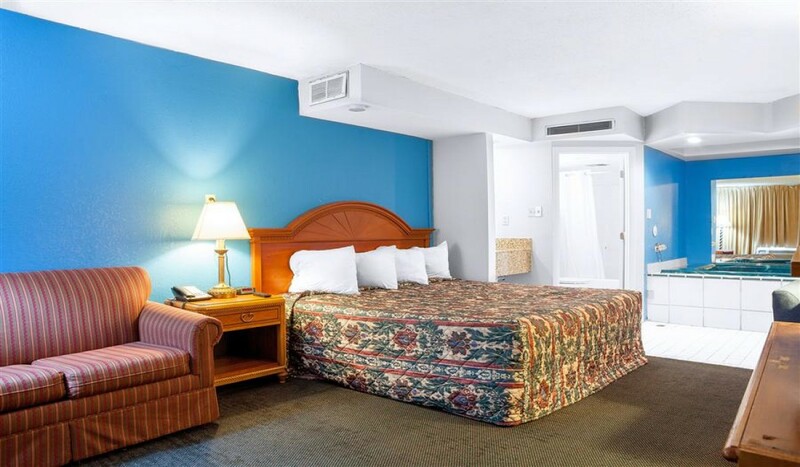 Our updated non-smoking room with 1 king size bed features Free WiFi, Free breakfast, Free parking, a flat-screen TV with cable channels for your entertainment. For your comfort, this room is equipped with a microwave, and refrigerator, an alarm clock, radio, telephone, personal climate control, private bathroom, and complimentary toiletries. 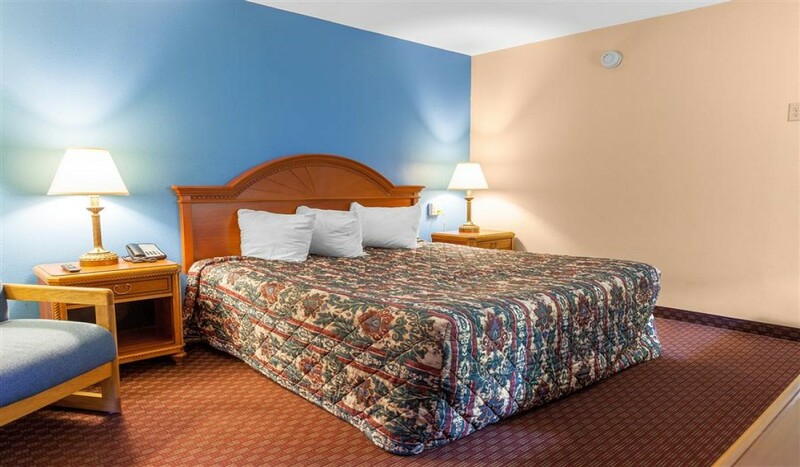 This refreshed non-smoking room with 2 full beds features Free WiFi, Free breakfast, Free parking, a flat-screen TV with cable channels for your entertainment. For your comfort, this room is equipped with a microwave, and refrigerator, an alarm clock, radio, telephone, personal climate control, private bathroom, and complimentary toiletries. 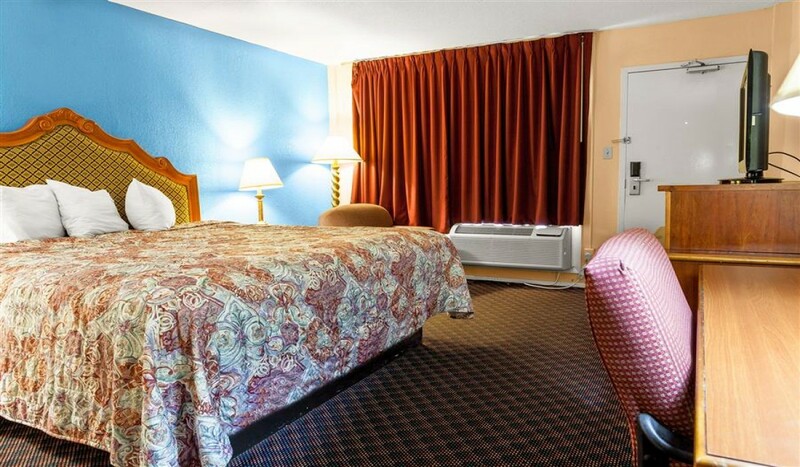 This updated non-smoking room features 1 king bed, a flat-screen TV with cable channels for your entertainment. For your convenience, this room comes with Free WiFi, Free breakfast, Free parking and is equipped with an alarm clock, radio, and a telephone. 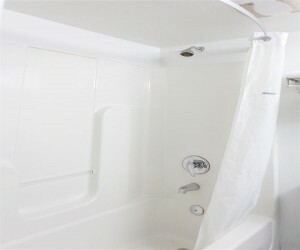 For your added comfort you will enjoy personal climate control, a private bathroom, and complimentary toiletries. Our economy smoking room has been newly updated and features with 1 king bed. 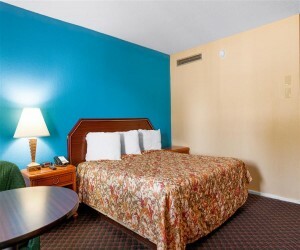 This room is equipped with a flat-screen TV with cable channels for your entertainment. For your convenience, this room comes with Free WiFi, Free breakfast, Free parking and is equipped with an alarm clock, radio, and a telephone. 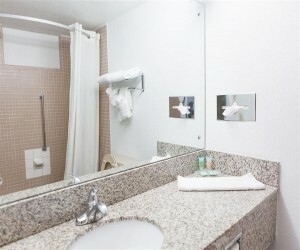 For your added comfort you will enjoy personal climate control, a private bathroom, and complimentary toiletries. 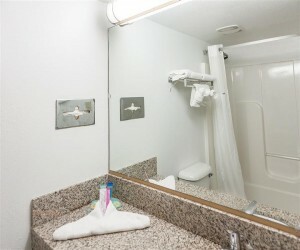 This remodeled non-smoking room with 2 full beds features an accessible bathroom. This room is equipped with a flat-screen TV with cable channels for your entertainment. This room comes with Free WiFi, Free breakfast, and Free parking. For your added comfort, this room provides a microwave, and refrigerator, an alarm clock, radio, telephone, personal climate control, and complimentary toiletries. This refreshed traditional smoking room with 2 full beds features Free WiFi, Free breakfast, Free parking, a flat-screen TV with cable channels for your entertainment. For your comfort, this room is equipped with a microwave, and refrigerator, an alarm clock, radio, telephone, personal climate control, private bathroom, and complimentary toiletries. Recently updated, our smoking room with 2 queen beds features Free WiFi, Free breakfast, Free parking, a flat-screen TV with cable channels for your entertainment. For your comfort, this room is equipped with a microwave, and refrigerator, an alarm clock, radio, telephone, personal climate control, private bathroom, and complimentary toiletries. Newly remodeled, our non-smoking deluxe business room with 2 queen beds is well-appointed and spacious; featuring Free WiFi, Free breakfast, Free parking, a flat-screen smart TV with cable channels for your entertainment. This room is equipped with a microwave, and refrigerator, coffee maker, an alarm clock, radio, telephone, personal climate control, private bathroom, a hair dryer, and complimentary toiletries. 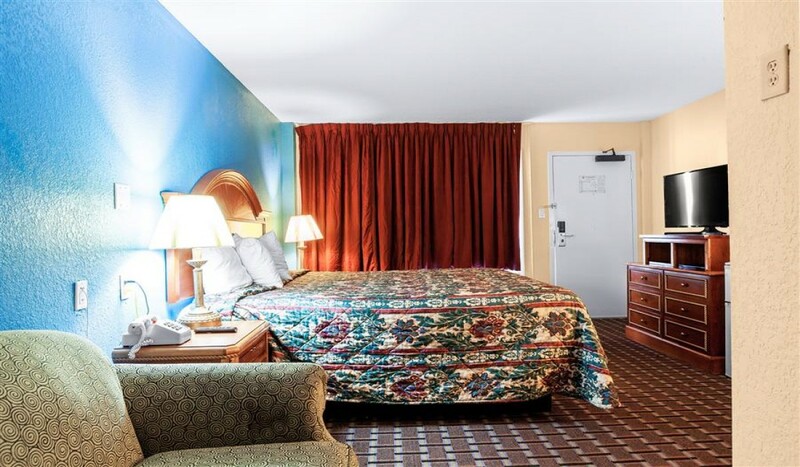 Our spacious and newly remodeled non-smoking room with 1 king bed features Free WiFi, Free breakfast, Free parking, a flat-screen smart TV with cable channels for your entertainment. 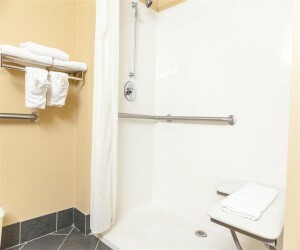 This room is equipped with a microwave, and refrigerator, coffee maker, an alarm clock, radio, telephone, personal climate control, private bathroom, a hair dryer, and complimentary toiletries. 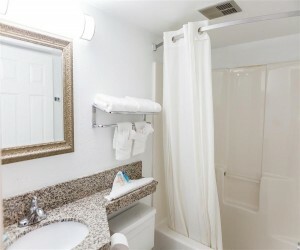 Our newly remodeled smoking room with 1 king bed features an accessible bathroom. This room also features Free WiFi, Free breakfast, Free parking, a flat-screen TV with cable channels for your entertainment. For your added convenience, this room provides a microwave, and refrigerator, an alarm clock, radio, telephone, personal climate control, and complimentary toiletries. Our King mini-suite offers enough space to unwind. This room features Free WiFi, Free breakfast, Free parking, a flat-screen TV with cable channels for your entertainment. For your comfort, this room is equipped with a microwave, and refrigerator, an alarm clock, radio, telephone, personal climate control, private bathroom, and complimentary toiletries. Our Spacious Hot Tub suite features a large, heart-shaped jetted tub, flat-screen TV with cable channels for your entertainment. This room comes with Free WiFi, Free breakfast, and Free parking. For your convenience, this room is equipped with a microwave, and refrigerator, an alarm clock, radio, telephone. For added comfort, you will enjoy personal climate control, a private bathroom, and complimentary toiletries. The Honeymoon suite is specially designed with romance in mind. At an impressive 435 ft, the Honeymoon suite comfortably fits a king sized bed in one area and a luxurious jetted tub in the other. This room comes with Free WiFi, Free breakfast, and Free parking. 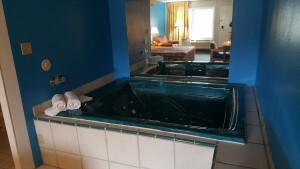 For your entertainment, this suite comes with a flat-screen TV with cable channels. 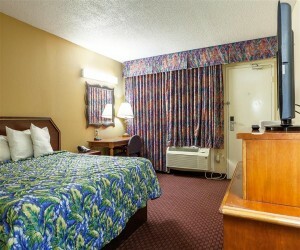 For your convenience, this room is equipped with a microwave, and refrigerator, an alarm clock, radio, and a telephone. For added comfort, you will enjoy personal climate control, a private bathroom, and complimentary toiletries. 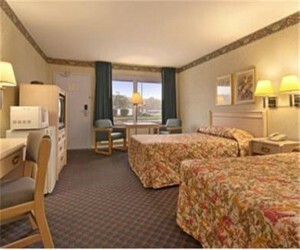 This spacious suite is also a great choice for weekend getaways. Our newly updated non-smoking economy room is equipped with 2 full beds and comes with a flat-screen TV with cable channels for your entertainment. For your convenience, this room comes with Free WiFi, Free breakfast, Free parking and is equipped with an alarm clock, radio, and a telephone. 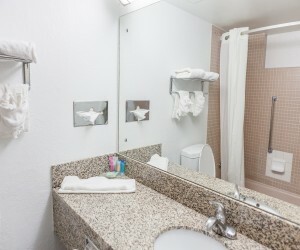 For your added comfort you will enjoy personal climate control, a private bathroom, and complimentary toiletries. 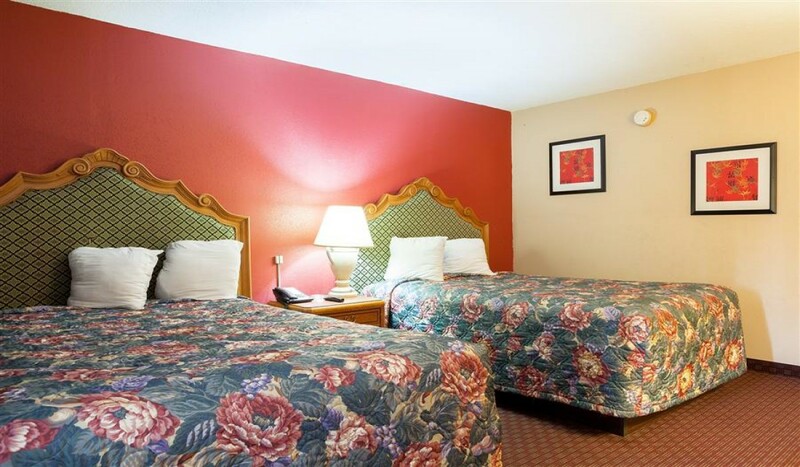 This refreshed traditional non-smoking room with 2 queen beds features Free WiFi, Free breakfast, Free parking, a flat-screen TV with cable channels for your entertainment. For your comfort, this room is equipped with a microwave, and refrigerator, an alarm clock, radio, telephone, personal climate control, private bathroom, and complimentary toiletries.